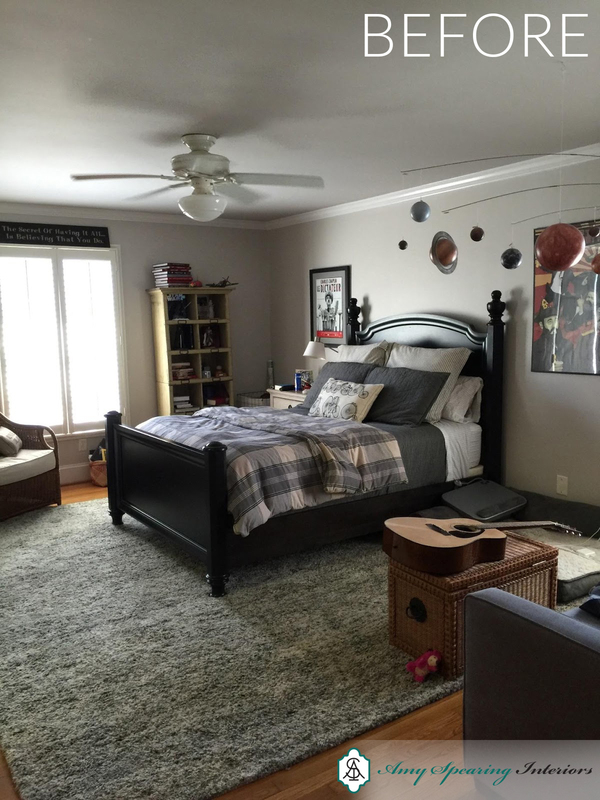 Kids’ rooms are one of my favorite spaces to decorate. 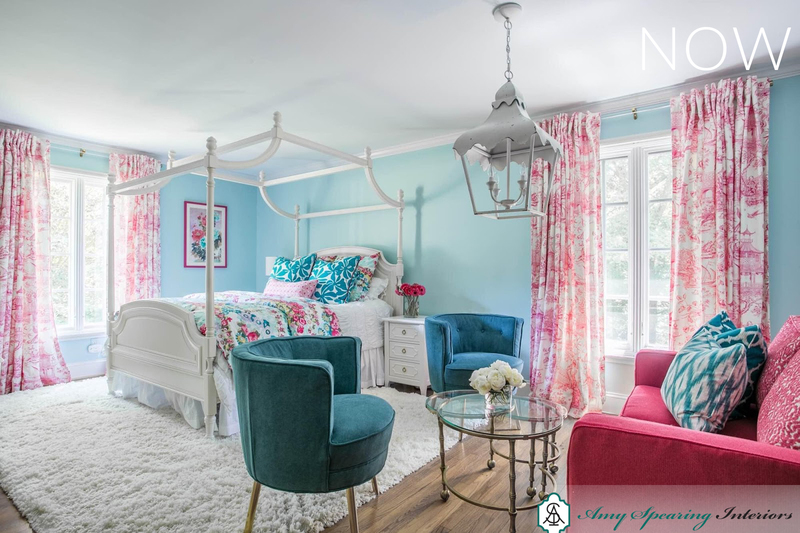 I always try to incorporate the child’s tastes in the space (after all, they are the ones who will be spending the most time in the space) while also satisfying the parents (who will be paying for the renovation). Sometimes it is a bit of a power struggle, not unlike husbands and wives who have different ideas about what they like. This project was really a dream, in many ways. 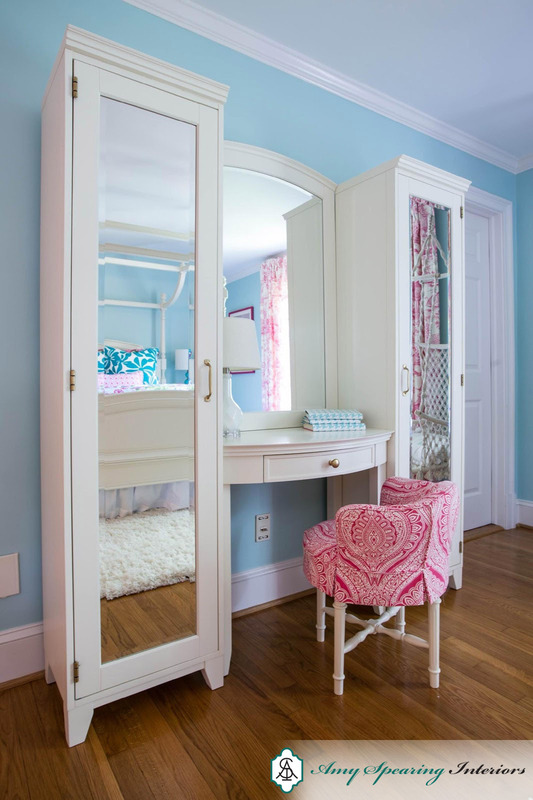 Mostly, I must admit, because if I was a preteen again this is the kind of bedroom I would want. I have always had a love affair with all things chinoiserie… show me a pagoda and I go weak in the knees. This room didn’t start off with this aesthetic in mind…. it just sort of morphed into it with perhaps a slight nudge from me. As our jumping off point, my client and her daughter had already found bedding they loved from Pottery Barn. 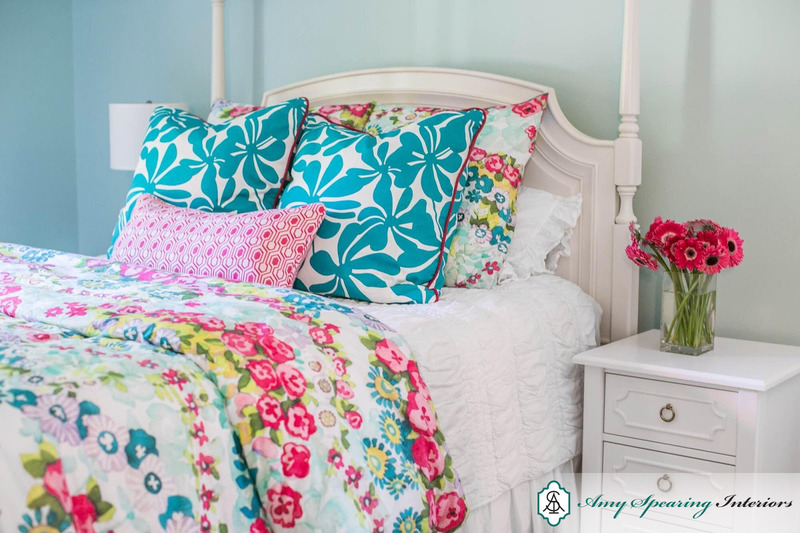 The pattern was a beautiful floral with fun shades of mint, teal and pink. 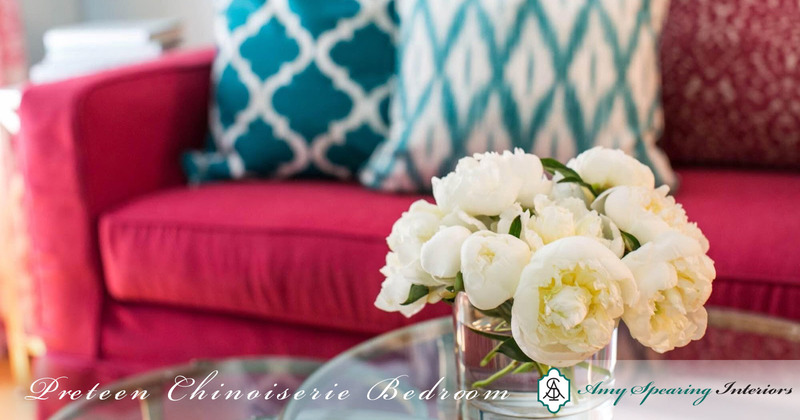 We chose Benjamin Moore’s Spring Sky as the wall color, a lovely pale mint. From there I sourced fabrics for the sitting room sofa, window treatments, pillows, and vanity stool. 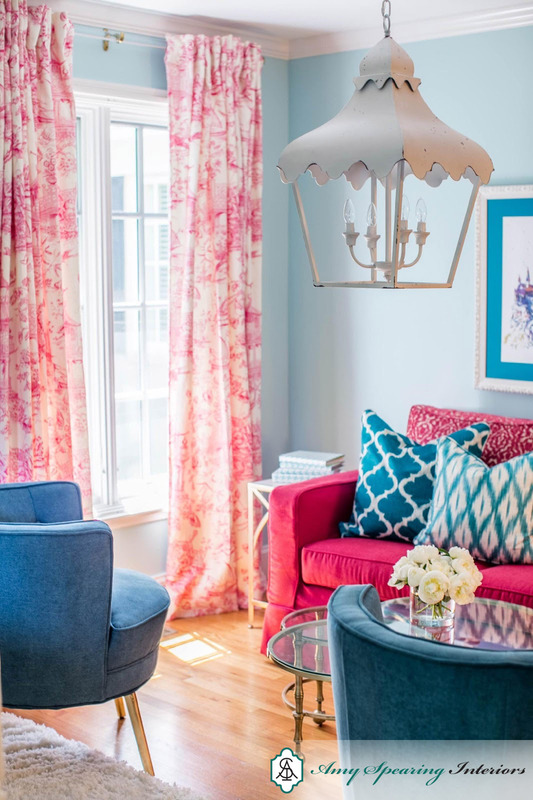 Of these, Molly chose the pink chinoiserie fabric for her curtain panels, which we hung from gorgeous lucite rods from Ballard Designs. The curtain fabric really set the feel for the room…. inspiring me to find the pink foo dog bookends (seen in the bookshelves of the desk area), the pagoda chandelier, and my client found the garden stool as an accent table. 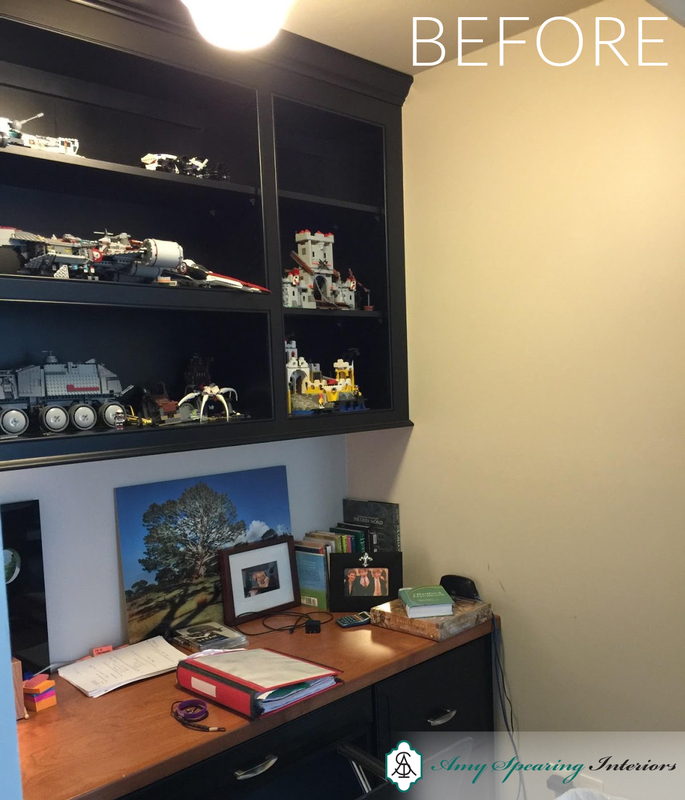 For the desk paint I chose Benjamin Moore’s White Dove, which closely matched Molly’s existing bed and nightstands. The back of the bookcase was painted Benjamin Moore’s Salzburg Blue (this color shows up in the pillows and sitting room chairs). 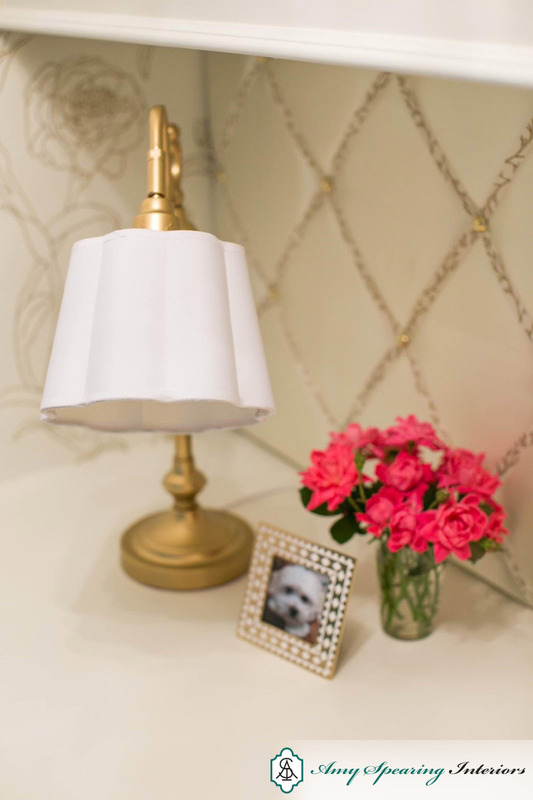 I then suggested we wallpaper the walls surrounding the desk nook with Peonies from Tempaper Designs, which has gold outlined peonies set on a light background very similar to White Dove. For the space between the desk and the bookshelf we decided on a French memo board design where Molly can tuck photos and momentos between the ribbons. 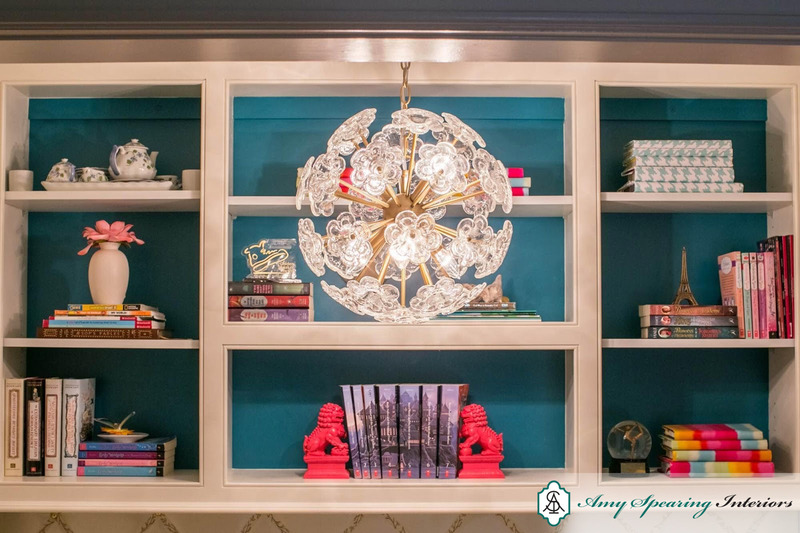 The Flower Pop Chandelier from Pottery Barn Kids hanging in front of the bookshelves was the perfect finishing touch. 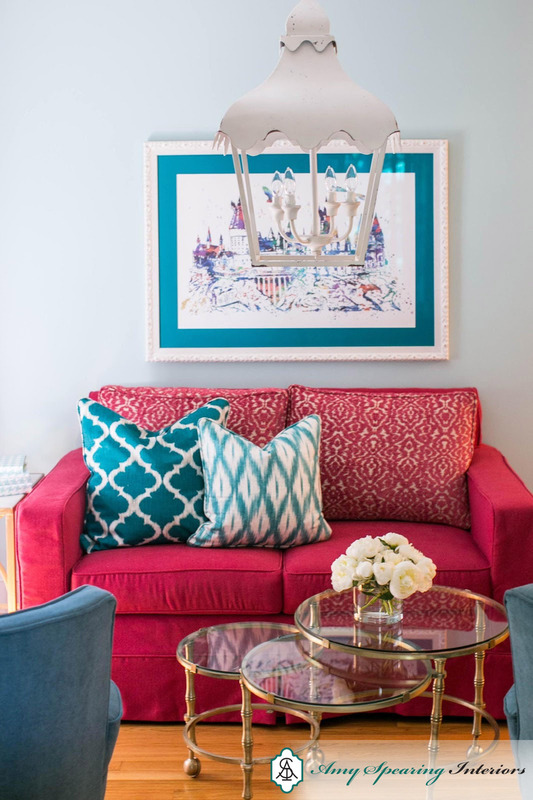 I really love how the little lounge space turned out, complete with a deep pink sofa, teal chairs and the oversized pagoda chandelier. Thanks for joining me to read my first blog post! I am hoping to blog on a regular basis as my mommy duties and client projects will allow. Would love to hear back from you! … Happy decorating! 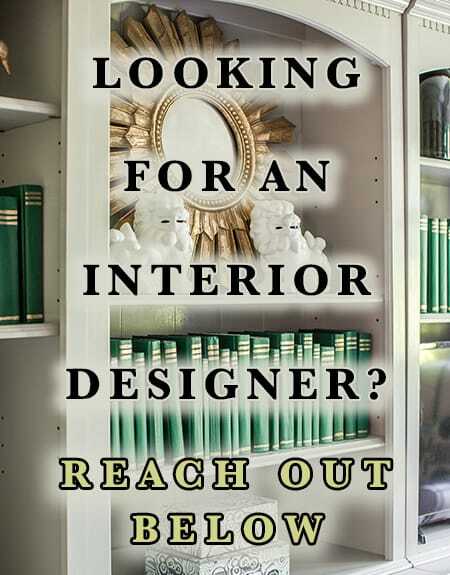 RVA Interior Designer. Coffee addict. Shopaholic. Foodie. Book hoarder. Love art museums, the theater, kir royales & visiting Paris. 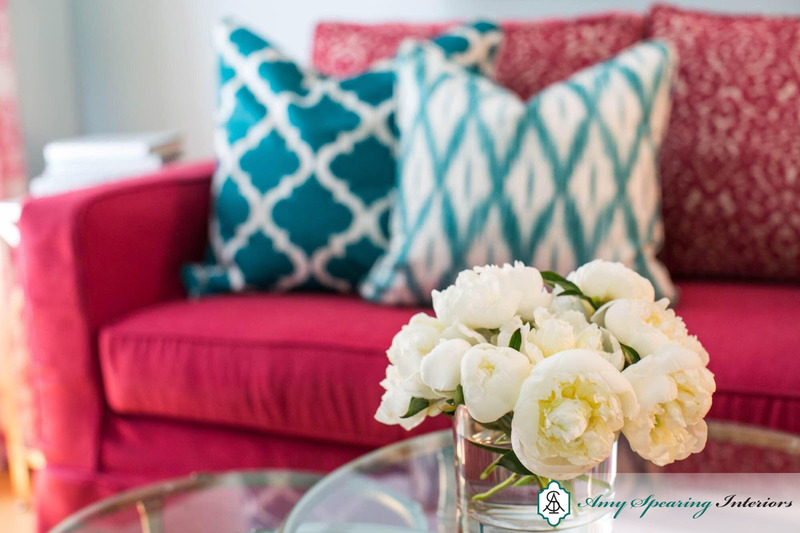 I love this room – what a lucky girl to be able to live in this room! 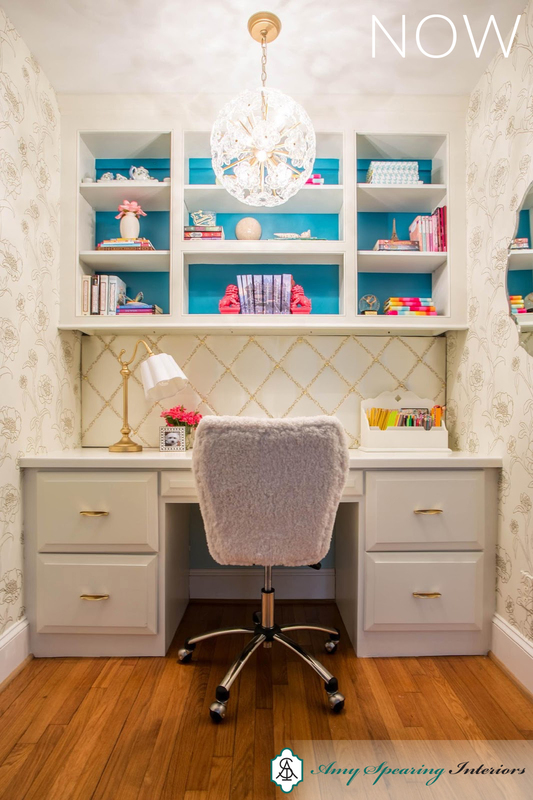 I especially love the pendant light in the desk nook. Do you think that could work as the ceiling light in a guest room (it’s ok to buy from PBK even if it’s not for kids – right?) I am wondering about the size. Thank you Laura! That pendant light is not very big so unless your guest room is very small I wouldn’t use it for the overhead light. © Copyright - Amy Spearing Interiors. Website Proudly Designed by Laborem Edge, LLC.